Cutting your hair at home can save a bit of money. Cutting your family’s hair at home can save you even more. If you’re looking for the perfect pair of cordless clippers to use in your home, you’re in luck. We researched the best-selling products and most talked about brands and put together this review to help you find just what you’re looking for. First, let’s look at some of the key things you should know before you shop. Run Time: This varies so much from product to product. The longest runtime we found was 8 hours though most of them are closer to 1 or 2. The more hair you’re planning to cut, the more time you need. Case: Most of these come with a really useful case that keeps all the combs and accessories together and makes it easier to travel. That said, you don’t necessarily need a case for a pair of clippers to be awesome. Pieces: This includes everything that comes with the clipper, including combs, scissors, capes, oil, brushes, and more. Some of these kits really do have everything you need for a true barbershop experience, right in your own home. Adjustable Taper: An adjustable taper lets you adjust the length of the blade right on the clippers themselves. Add in the various comb attachments and you really can get a lot of different looks and styles. Dimensions: The size of the clippers is important to consider, especially if you’re going to be using them professionally. You want something that’s going to be comfortable to use so you stay pain-free and have better control. Warranty: Most of these products are covered with some kind of warranty, usually around 1 or 2 years. Some warranties last up to 5 years. Read the fine print carefully so you know what’s covered and what isn’t. Not that you know what to look for, let’s move into our product reviews. If you’re in a hurry, start right at the top of our list. Our top and budget picks are the first things you’ll find and are a good way to get an understanding of the range that’s available. We found a lot of great stuff so stick around for all of them if you can. You never know which ones are right for you. Ready? Let’s go. Our top pick for best professional cordless clippers is this amazing set from Wahl. One of the best things about this product is the battery. Not only does it have a 2 hour run time, but it also has a 10-minute quick charge feature to give you just a little more juice right when you need it. This is a great set that comes with multiple color-coded guide combs, a brow guide, and an ear guide as well as a separate trimmer tool and a soft storage case to keep it all in. The precision, self-sharpening blades stay sharp and snag-free and cut hair up to 40% faster the Wahl’s standard precision blades. Plus, it has a more powerful motor, too, for faster cutting through any hair type. Next up is our budget pick, the Philips Norelco Multi Groomer. This one comes with everything you need for complete grooming including a nose and ear trimmer, guides for trimming your hair and beard, and a stubble guard. With DualCut technology, you get twice the number of self-sharpening blades that are just as sharp after 2 years of use. They’re made of tempered steel and will never break or rust. That’s not all, you can also easily detach the blades from the handle and run them under water for easy cleaning and maintenance is easy because you don’t need to use any blade oil. All of the attachments are rinseable, too, and the powerful battery runs for up to an hour with a full charge. The Remington HC6550 has something we haven’t seen before and it’s too amazing not to share. 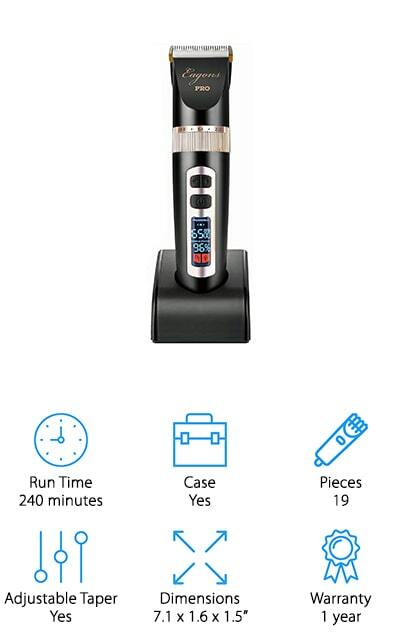 Get this: it’s equipped with its own vacuum. That’s right, these clippers contain a powerful vacuum that takes care of clippings as you cut instead of letting them fall to the floor. The titanium-coated blades have a perfectly ground edge and can tackle even the thickest hair. There are 9 different comb attachments included, too, which gives you a lot of options when it comes to styling and grooming. Although it runs for up to an hour on a fully charged battery, you can also use it plugged in if you need more time. This kit includes a lot of great stuff, like barber scissors, and a cleaning brush and oil for routine maintenance and cleaning. We think the Hatteker Cordless Hair clippers are one of the best cordless hair clippers for bald head. 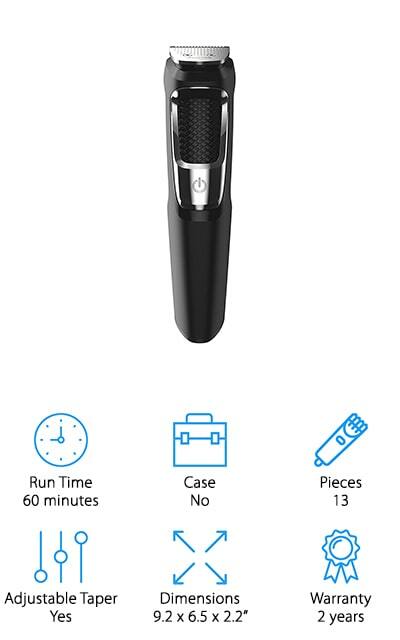 It features adjustable titanium ceramic blades that can be used to shave off new growth or style longer hair as well as 7 different guide combs. An easy-to-read LED display shows you the battery capacity in minutes so you know exactly how much time you have left. When you need to charge it, you can plug it in and continue using it or set in the charging base to get ready for next time. And get this, it charges with a simple USB cord so it’s really easy to use it when traveling. Simply charge it as you would your cell phone with an adapter, in your car, or using a laptop. 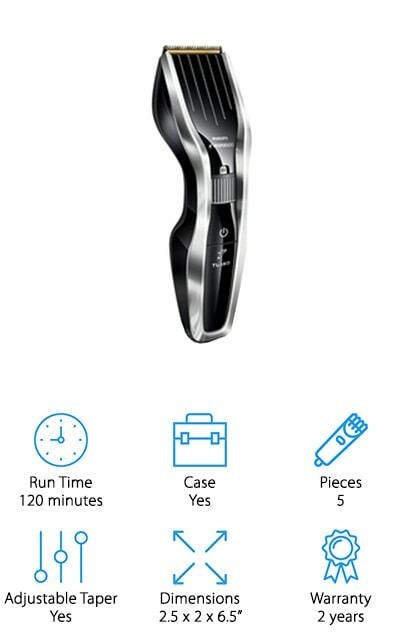 What makes the Philips Norelco 7100 one of the best cordless clippers is that it doesn’t require any attachable combs. Believe it or not, this adjustable blade has 23 different settings so you can get the look you want by simply locking in the length right on the clippers themselves. DualCut technology allows for faster, smoother cutting and the titanium blades are self-sharpening and built to last. That’s not all, they’re also easy to remove so you can rinse them under water for cleaning. If you have really thick hair, don’t worry. The turbo boost button gives you the power you need, right when you need it. 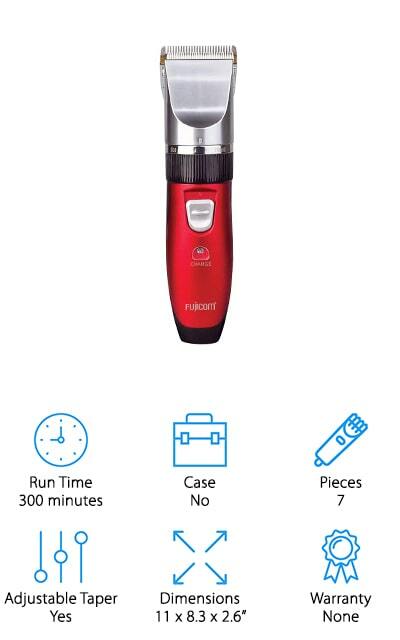 Because there are no attachments, this is a great option for travel. It even comes with an easy to pack hard case. Next up is Eagons PRO Clippers, some of the best cordless clippers for barbers. Why do we say that? For one thing, they’re really versatile. With 3 adjustable speed settings, they’re great for cutting through all types of hair. The blades are made of tough titanium and ceramic for long-lasting sharpness that glides smoothly through your hair. With 5 adjustable blade positions, multiple guide combs, and a hair thinning comb, you can use these clippers to create a lot of different looks. That’s not all, you also get a neck hairline trimming guide and a beard shaper to create a really polished look. One more thing: a fully charged battery provides 4 hours of runtime, which is one of the longest runtimes we found in our research. While the Sminiker Professional Hair Clippers are designed for humans, they’re the best cordless pet clippers on our list. Why? One of the main reasons is because they’re really quiet so they won’t spook an anxious pet who doesn’t like being groomed. Of course, you’ll love them, too. One of the best things about this product is the runtime. A fully charged battery provides up to 8 hours of use, the longest runtime of any of our top picks. 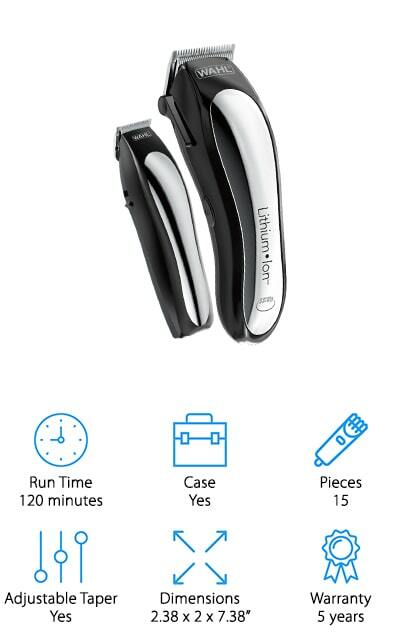 There’s more, they titanium and ceramic blades stay sharp and move easily through your hair. They also have an R-shaped rounded edge that prevents skin irritation so they’re great for anyone with sensitive skin. There are 6 different guide combs included as well as a 1-year warranty. Queetus is next on our list with this kit that includes everything you need to cut any kind of hair. There are 3 different speed options so, whether you’re working with hair that’s thin or particularly dense, you can adjust the settings for the right amount of power. That’s not all, there are also 6 different attachments to create a variety of styles. 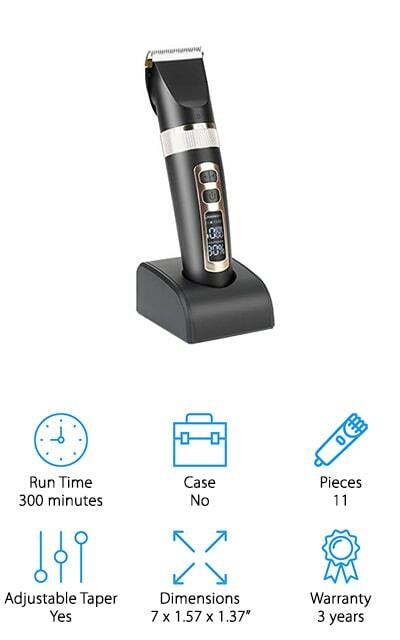 These clippers feature an LCD display that tells you everything you could possibly need to know: battery capacity, recharge alert, rotating speed, and when it’s time to oil the blades. 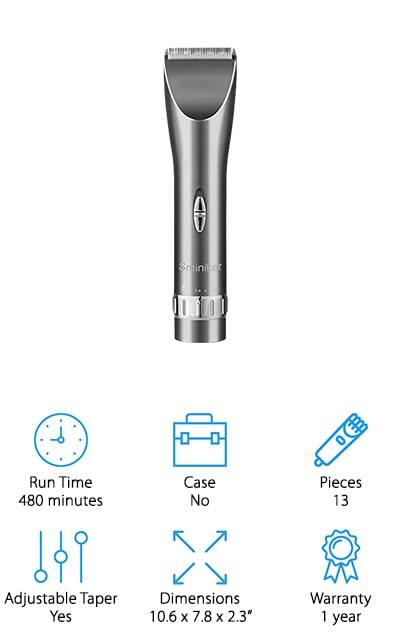 This is a great choice for international travel because it can use either 110V or 240V input to charge. It takes about 3 hours for a full charge, which provides 5 hours of runtime. These clippers from Fujicom are great for styling your hair or your beard. The white ceramic blades stay sharp over time. They have 5 different length settings, too, and since there are also 4 different attachment combs included, you can really customize your style. Because of the lightweight, ergonomic design, these are a great choice for a hair stylist or barber. Your hands won’t get tired or sore even after prolonged use. While these clippers don’t technically include a case, the charging dock is one of the best things about it. Why? Because it also functions as a sort of display case so you can keep everything in one place. All the combs fit nicely onboard and there’s even a spot for blade oil, too. 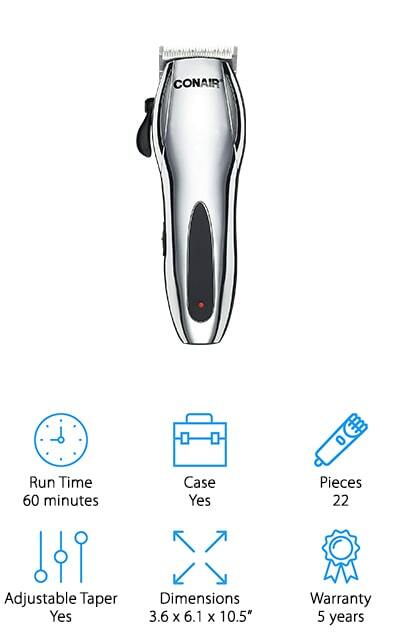 The Conair Cordless Haircut Kit is last up in our reviews of professional cordless hair clippers. These chrome clippers feature removable stainless steel blades that are easy to clean and self-sharpening. With a 5-position taper and 10 comb attachments, there are 55 setting in all. These are the best cordless clippers for shaving head but can be used to do a lot of other styles, too. This set also includes a barber comb, barber scissors, styling clips, and a barber cape as well as oil and a cleaning brush for regular maintenance. A full battery runs for about an hour and you have the option to use it corded, too. That’s not all, with 5 years of coverage, it also has one of the best warranties we found.